I excitedly announce that Do It Myself Blog is a finalist for the Best of Blog Award, under the Best Inspirational Blog category. Winners will be determined by the number of votes received until Friday, April 13, at midnight EDT. The Grand Prize winner for this category will be announced in Las Vegas at Blog World Expo in November, and will receive free exhibits registration at the expo. Darrell and I have been talking about going to Las Vegas with friends, so Vegas for my birthday would be a blast! Let’s see if the Law of Attraction works here! I was not aware that I was a finalist until last night and, apparently, voting has been open for a while. I would like to request your assistance in making up for lost time by helping to spread the word, please. And, voting is “American Idol” style — you can vote once per day (cookies must be enabled on your computer for your vote to be counted each day). Thanks to Wendy Piersall for nominating Do It Myself Blog for this award! Hey Doc, Where’s the Laughing Gas? Now Where is Glenda Off To? My vote is in! Good luck Glenda. Happy to hear you are starting to feel better too. I enjoy Glenda’s website. 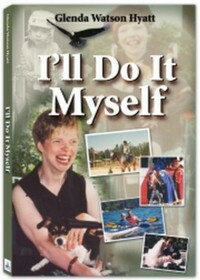 She is an inspiration to me and my 21-year-old sister who had CP, like Glenda. I hope she recieves this award and God bless her. Glenda, you are a winner in my book and an inspiration. May the force be with you! Glenda, you are a real inspiration to all who read what you have to tell us. What a neat idea– a Virtual book tour! I’m at the beginning of writing my own book and after reading your blog– I’m inspired to continue.